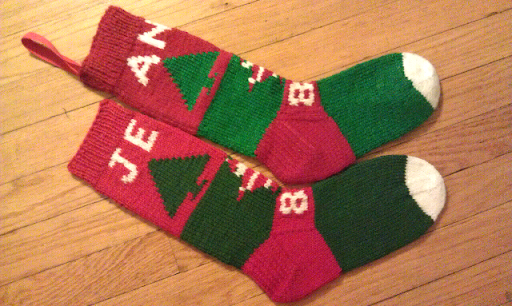 "In Jim’s family, Jim’s grandmother and then his mother knit Christmas stockings with one’s name and year of birth. It has become a big family tradition with stockings for spouses and children. 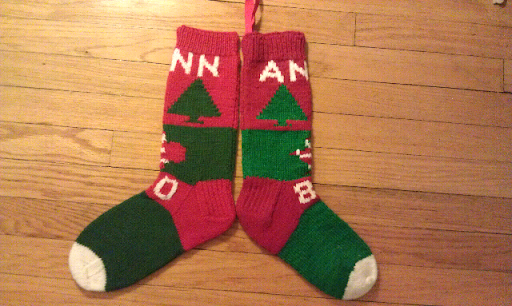 Unfortunately, Jim’s mother has some dementia and can no longer make these stockings. I was thinking that one for Jenn next year would be an additional sign of welcoming her to the family." I felt so honored when I received the following email from the Richter family. They have been close to my husband's family for years (I met them the same day I met my now in-laws!) Both of my grandmothers have suffered from some form of dementia, so I can understand the effects this can have on a family. 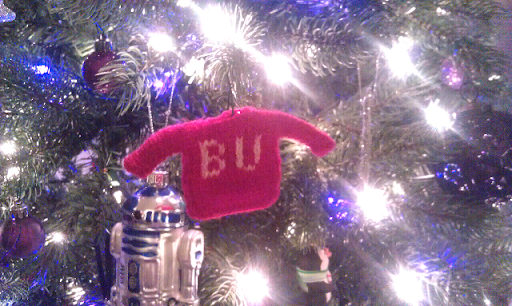 This makes it even more special for me to help keep this tradition alive. 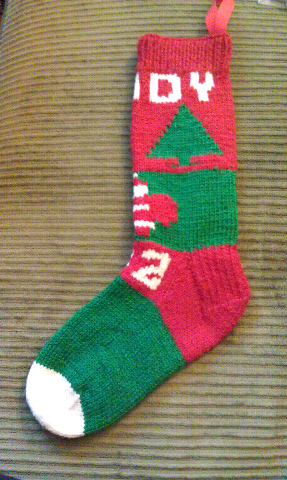 I reverse designed this stocking based on the sample mailed to me. 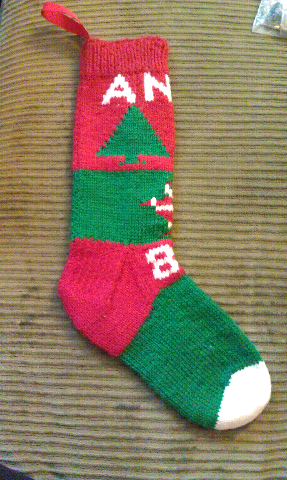 Although there are some things I may have done differently if I were designing this stocking from scratch, I am going to try to replicate the construction as authentically as possible. 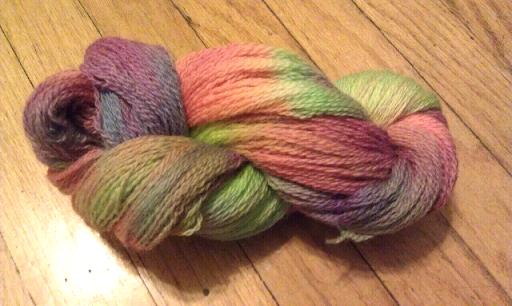 Wool of the Andes Worsted Weight Yarn in White (9 g), Grass (Green; 35 g) and Red (35 g). 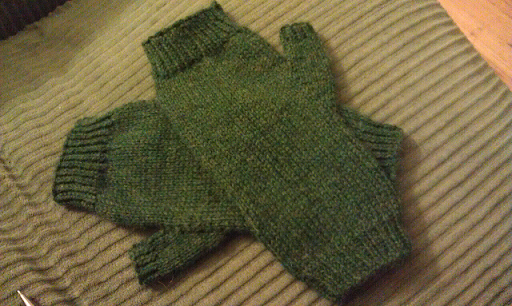 Size 3 knitting needles, both straight and double pointed needles are used in this project. 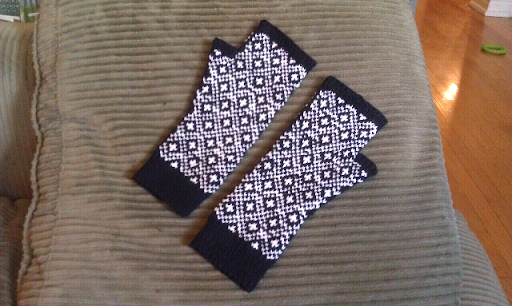 Finished size: 4.5" wide, 12" cuff to heal, 9" heel to toe. 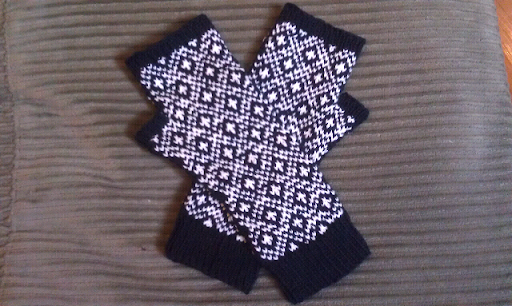 The Pattern - Please note that parts of this stocking are knit flat, and others are knit in the round. 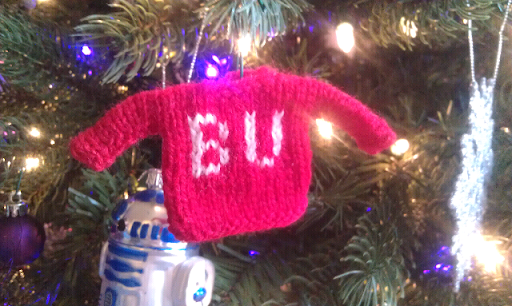 Stocking Body - Worked Flat until the end of Santa. Last two plain green rows worked in the round. 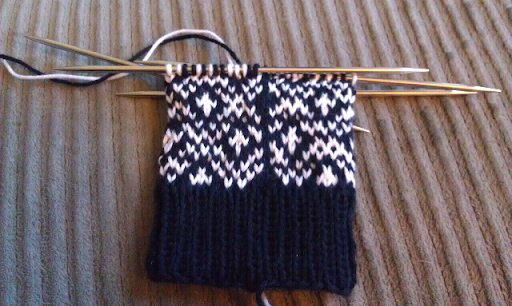 Starting on a WS (wrong side) row. Begin working the chart starting from the bottom, purling on WS rows and Knitting on RS rows. Note 1:WS rows follow the chart from left to right, RS rows follow the chart from right to left. 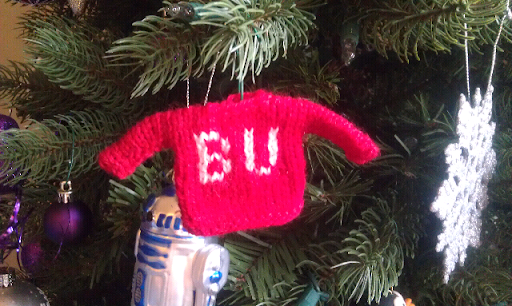 Note 2: I used stranded techniques for the name and Santa, Intarsia for the trees. 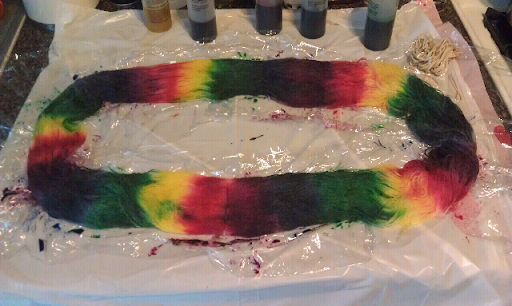 I made 4 g "bobbins" for each color for the trees section. Open the chart in a new window for a larger view. 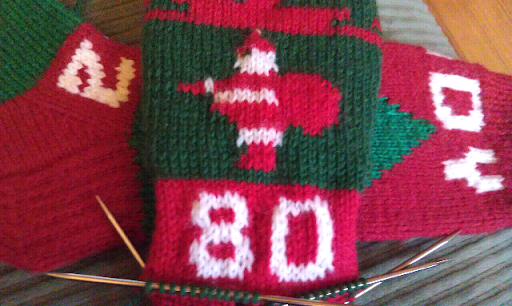 Continue working the chart until you finish the feet of the Santa figure - 58 rows, ending on a RS row. 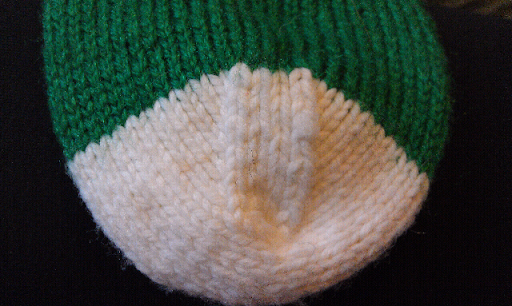 Switch to double pointed needles (or your preferred method of working in the round) and knit the last two green rows but DON'T BREAK THE GREEN YARN YET. Make sure you mark the beginning of the round. 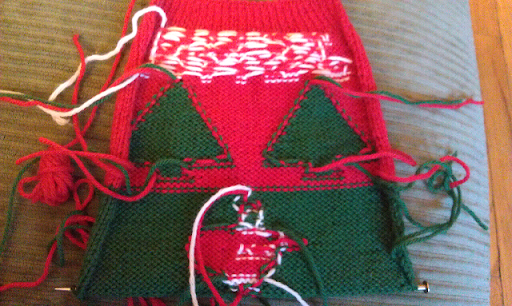 Break green yarn and join red. Repeat rows 1 and 2 until 13 times (26 rows total), ending after a Row 2. 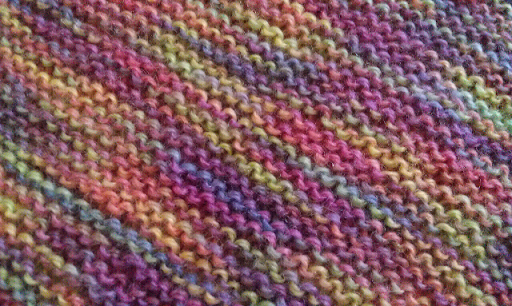 Continue pattern as established until 18 stitches remain. 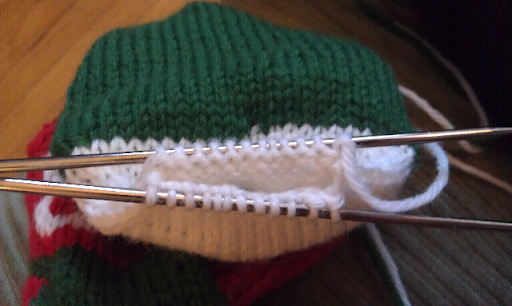 Knit across 16 stitches of the heel, pick up and K 14 sts along the sides of the heel flap. 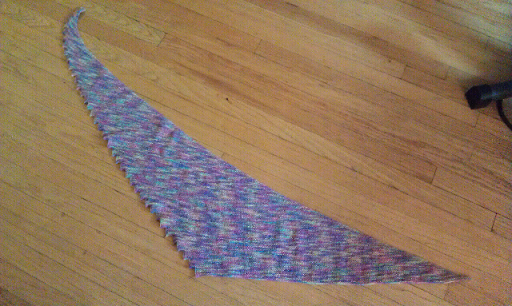 K 24 stitches (the stitches set aside previously.) 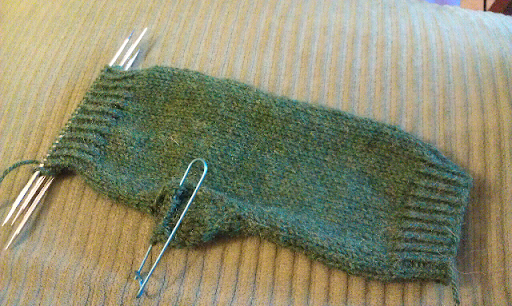 Pick and and knit 14 stitches from the other side of the heel flap. (68 sts). 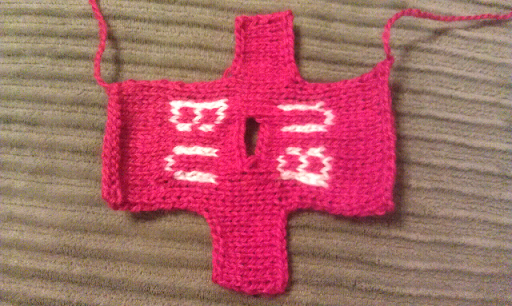 K 8 stitches (half way across the heel flap) and place marker. From here on out, this is the beginning of the round. K 1 round red. Break red. Continue pattern as established (alternating decrease rounds with K rounds) until 24 sts remain. 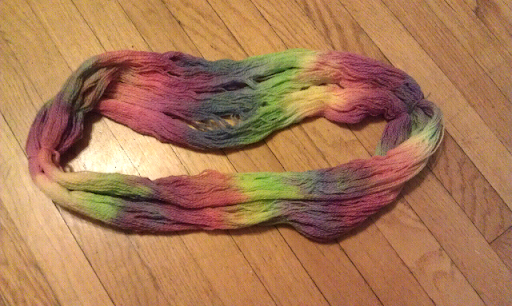 K 6 stitches and break yarn leaving a long tail. 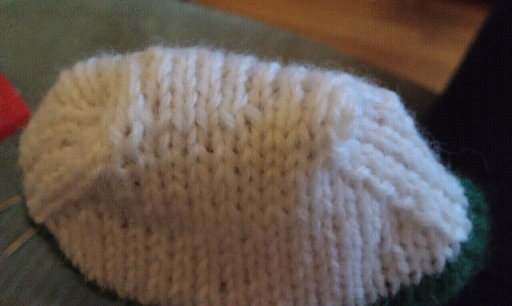 Graft the toe together using the Kitchener stitch. Block the stocking. I soaked the stocking in water for 20 minutes and then laid it out wet. Allow the stocking to dry completely. Pins aren't really necessary to get the stocking to lay flat, but you can pin if necessary to get the desired dimensions. Sew a ribbon onto the cuff of the stocking, hang and admire! 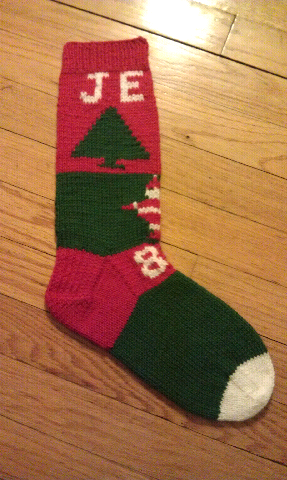 The flat portion of the stocking. 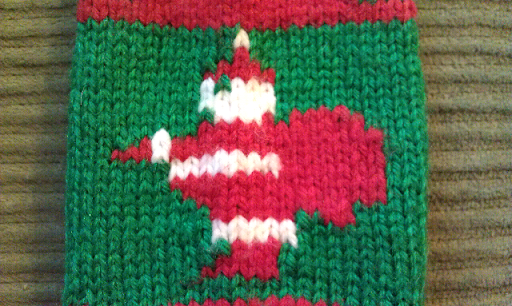 The name Jenn was knit using stranded colorwork methods, the Christmas trees and Santa were knit using intarsia techniques. 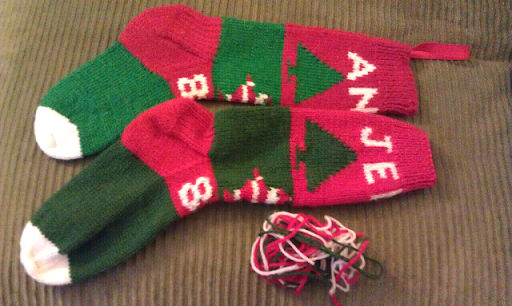 Checking the length of Jenn's stocking against Andy's stocking. Working in the round to add Jenn's birth year. 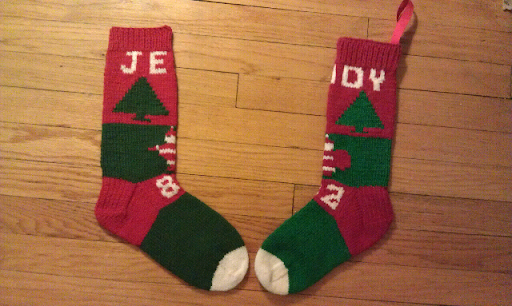 The old (Andy; top) and new (Jenn; bottom) stockings. 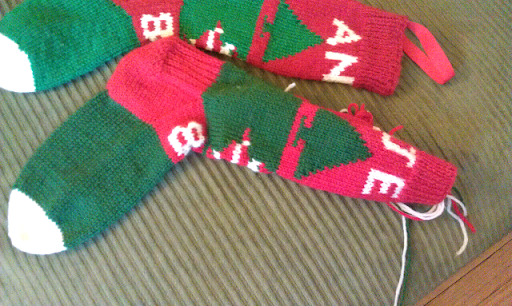 In the left photo, Jenn's stocking had not been sewn together yet, and in the right photo it still needs blocking. 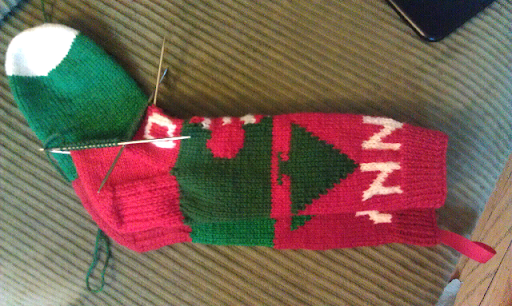 The toe of the stocking, before and after it was grafted together. 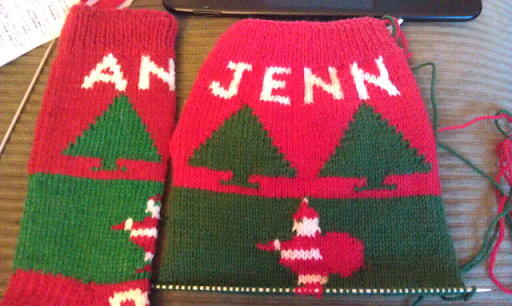 Jenn's finished stocking (bottom) next to Andy's original stocking (top.) 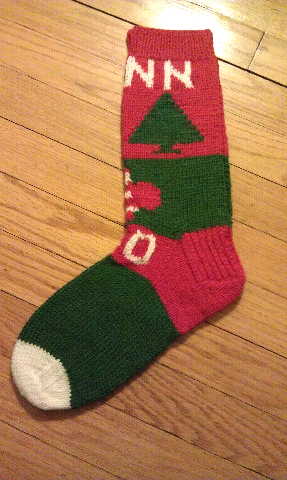 Do you think I did a good job recreating the stocking? Andy's original stocking that was the model for this knitting pattern. 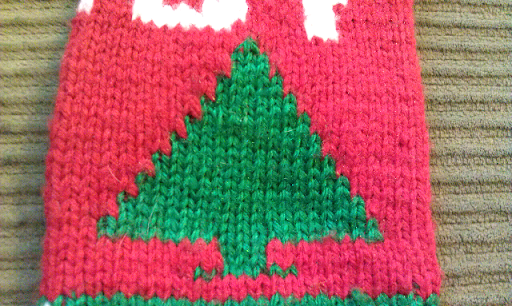 Some pictures of the details from the original (Andy's) stocking. 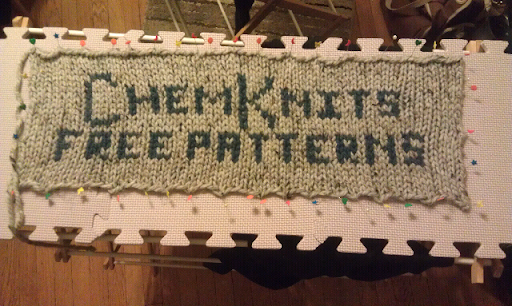 Back in April, I started upgrading the ChemKnits blog. One thing that remained of the old design is the wonderful Free Patterns by ChemKnits button my husband, Keith, designed for me. 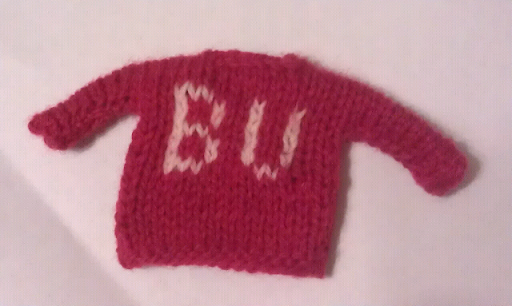 The colors matched the old background and color scheme, and do not go quite as well with my new knit logo. I therefore felt it was time to upgrade this button by knitting a new one, which I started testing at the end of November. Here is the pattern that I followed to create the new button. 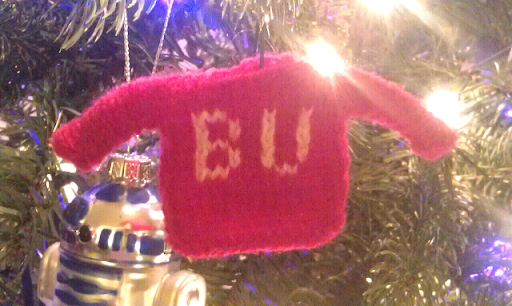 Do I expect the rest of you to knit this? Of course not! 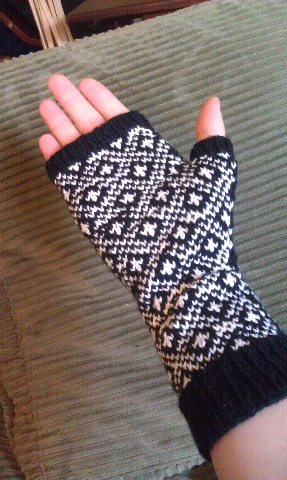 I figure that by sharing this pattern it may inspire you to create your own knit logos. I also just need to make sure I keep track of my notes. 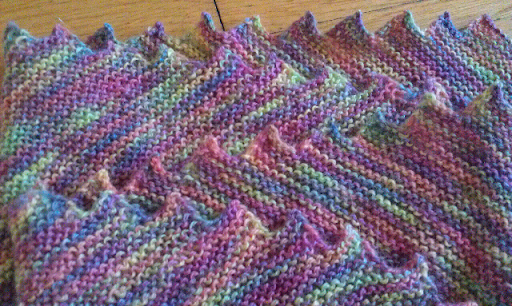 Continue until all 15 rows of the chart have been knit. Block the pattern on a blocking board, taking care that it is level with the bottom. Photograph in a well lit area. Crop the photo and upload to your website.